I recently bought an Icom IC-718 HF Transceiver with LDG AT-100ProII Automatic Tuner. Though this tuner automatically senses the frequency output and tunes itself on transmit, it also has an interfacing option to connect to many of the Transceiver brands like Icom, Yaesu, Alinco, etc to tune to the current operating frequency with a touch of a button from the Transceiver itself. I realized the option would come really handy for everyday use, but It was too late. The cable isn’t available in India and ordering one from the US costs a lot of shipping (twice the price of the product). So the only option left was making one. It looks fairly easy to homebrew this cable if a P3-Molex connector is available. As that too wasn’t available I hacked a Molex connector from a PC SMPS Molex to Sata converter to use it with our Tuner interface cable. Heres the wiring diagram for making the interface as listed on the LDG Electronics website. 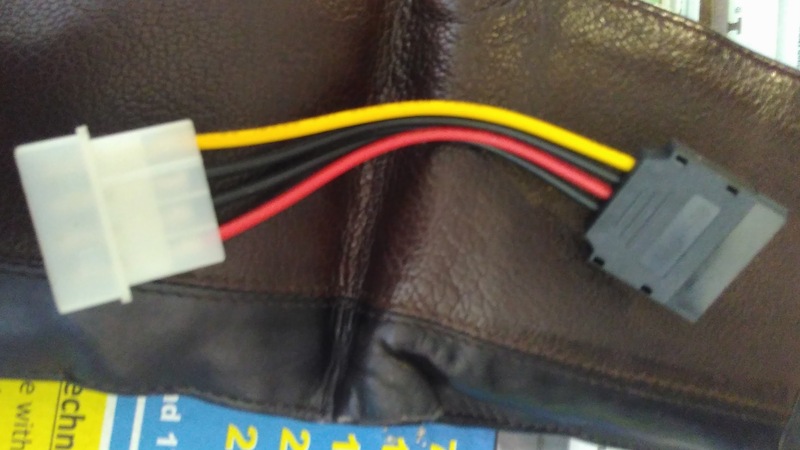 Cut a groove on one side of the Molex connector as per the below picture. Connect Pin 1 (from Groove) of Molex to tip of the Stereo Jack, Pin to to Ring and Pin 4 to Ground. Also connect Pin 3 of Molex to Center core of the power jack and another wire from pin 4 to the Ground of Power jack. Here’s the completed cable. It uses a 3.5mm Stereo male Audio jack, Shielded 2 pair stereo audio cable and the same Power cable which came with the Tuner (red in below picture). Made this for under Rs100/$2 🙂 Let me know if you were successful making one and leave your comments below for any improvements or suggestions. 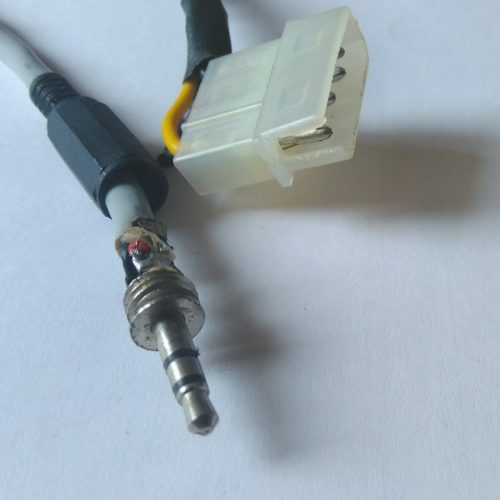 Update: A cable for Yaesu rigs is documented here. Hello. Could you please guide me how to homebrew an interface cable for my yaesu ftdx 1200 and ldg at 600 pro ii. Do test and let me know if it works. Happy homebrewing. Received my LDG tuner this morning. Its the first time I bought something like this new and I was expecting to find a Yaesu and Icom interface cable in the box. I should have done some better homework. Anyway, thank you for sharing , I was able to copy your cable in about 2 hours. It works. If I can make a suggestion. Just add a better illustration of where the ground wire goes. It took me some time to realize that it needs to go to the power plug and the serial plug. 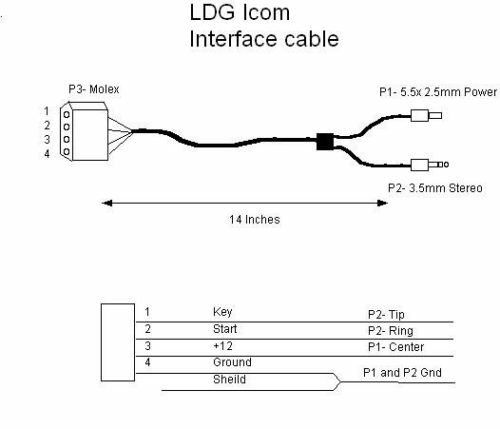 Have you done the Icom CI-V interface cable ? Thanks for the update JJ. Actually, I copied the illustration straight from the LDG manual. But yes, it makes sense to add a point somehwhere which says, connect all the grounds/shields (pin 4 from Molex to ground/shield of all the other connectors) together. Yes I did make a CI-V interface cable but never got to documenting it. For starters, you can use a USB to TTL isolation dongle available cheap from Aliexpress. Just connect the RX/TX pins of TTL side to tip of the 3.5mm stereo, leave the middle ring un-connected and GND to Shield of 3.5mm Stereo. You have a nicely isolated CI-V cable under 10$. Do post a pic if you make one ! This is Deep, VU2CSB. I have a ICOM IC-7200 and collected one ICOM AT-130E, tuner from junk.But I do not have the control cable. 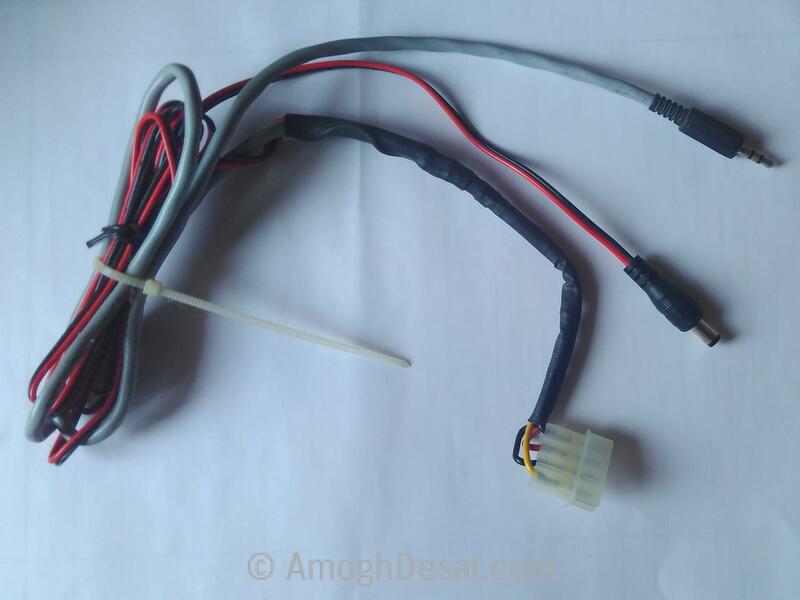 I need 4 wires shilded cable and 4 pin molex connector to make the control cable.Seeking for your guidence. Its exactly the same cable as shown in the diagram above. What guidance do you need exactly ?